Our mentors are friendly, experienced Objective-C developers who will help teach you new techniques and tricks. 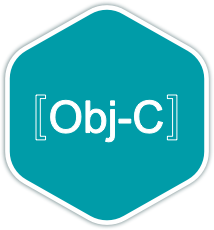 Objective-C is a thin layer on top of C, and is a "strict superset" of C, meaning that it is possible to compile any C program with an Objective-C compiler, and to freely include C language code within an Objective-C class. Objective-C derives its object syntax from Smalltalk. All of the syntax for non-object-oriented operations (including primitive variables, pre-processing, expressions, function declarations, and function calls) is identical to that of C, while the syntax for object-oriented features is an implementation of Smalltalk-style messaging. You can find more information about the language and its history here. Once you join the Objective-C language track, you will receive support and feedback from our team of mentors. Here are the bios of a few of the mentors of this track. These are a few of the 51 exercises on the Objective-C track. You can see all the exercises here. Get started with the Objective-C track. As with everything on Exercism, it's 100% free!